Today we took our first Biblical Archaeology field trip to survey some of the topographical and archaeological features of Jerusalem's immediate surroundings. I have taken tours of the landscape before, but this time I was looking through a different lens -- a more focused one, but also a much foggier one. Before I talk about the trip itself, I need to give you some context. "A multi-vocal literary creation, produced by a variety of authors and editors over many years and containing varying and even contradictory views, beliefs and language." I'm still ruminating over the implications of this statement. I'm still mulling over the impact of presenting this definition of the Bible to the newest generation of Jewish educators, Rabbis, and Cantors. But that's a blog post for another day. As we boarded the bus, I wondered where exactly we were heading. I knew the bus was taking us to the three locations listed on our syllabus -- Nebi Samuel, Ramat Rachel, and the Haas Promenade -- but I was caught up in bigger questions: how holy is this holy ground? To what extent do I believe that our ancestors traversed these same trails? And even as archaeological evidence proves or disproves the Biblical narrative, how do I navigate when I am caught between faith and fact? Inside this mosque, which used to be a church, is an underground chamber in which a small synagogue is located which contains the tomb of the Biblical prophet Samuel. ...I know. It's a mouthful. 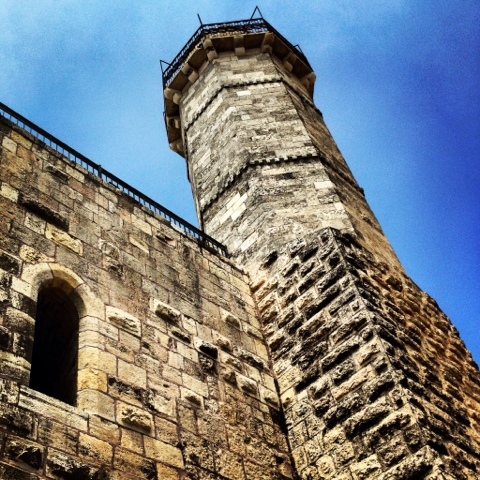 Riddled with bulletholes from World War 1, this mosque/synagogue/former church sits atop a hill overlooking Jerusalem. To get there, our tour bus drove outside of Jerusalem's '67 borders and into settlements and villages that were annexed two weeks after the war. When I think of settlements, I usually imagine ramshackle, temporary structures scattered across rural hills or valleys. But we drove through areas heavily populated with young religious families, apartment complexes stacked one on top of the other, shopping malls and office buildings flanking the busy streets. 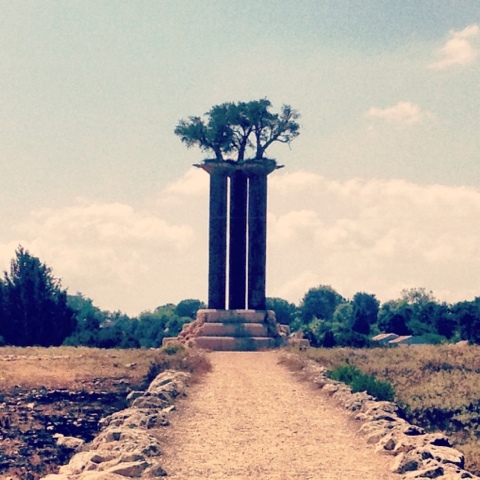 The Olive Columns, an environmental art structure at the entrance to Kibbutz Ramat Rachel. Our next stop was Kibbutz Ramat Rachel, which contains within it some notable archaeological findings. We explored the ruins of the Biblical fortress Beit HaKerem, where warning signals were sent to Jerusalem at the end of the First Temple period. 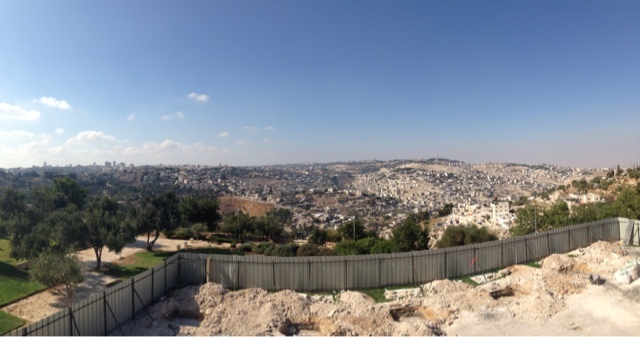 We also had a beautiful vantage point from which we viewed all of East Jerusalem, and got a clearer sense of which areas were populated by Arabs and by Jews. Our final stop was the Haas Promenade, which was a familiar sight for many of us who came here during our orientation last week. This time, however, we were able to identify some of the clear signs of Israeli or Palestinian villages, such as different colored water towers or roofs. The promenade also provides some of the most beautiful views of the entire city of Jerusalem, and it was a gorgeous way to finish up our tiyul. My head is swimming with new information and new questions. Did this really happen here? Is this person really buried there? And is this land -- the land I will now inhabit for the next year of my life -- really the land of Abraham, Issac, Jacob, Sarah, Rebecca, Rachel, and Leah? And as Rabbi David Wolpe might further challenge: does any of that even matter in the first place? As I conclude my first full week of classes here at HUC, I have many more questions than answers. It seems that the more I learn, the less I know. I remember writing in my admissions essay that the defining moment for me when deciding whether to enter the clergy was recognizing that Rabbis and Cantors and Educators will never have all the answers. We will, however, have ALL THE QUESTIONS. Maybe this will be my new normal. But for now, it feels good. It feels... Jewish. And it feels right.